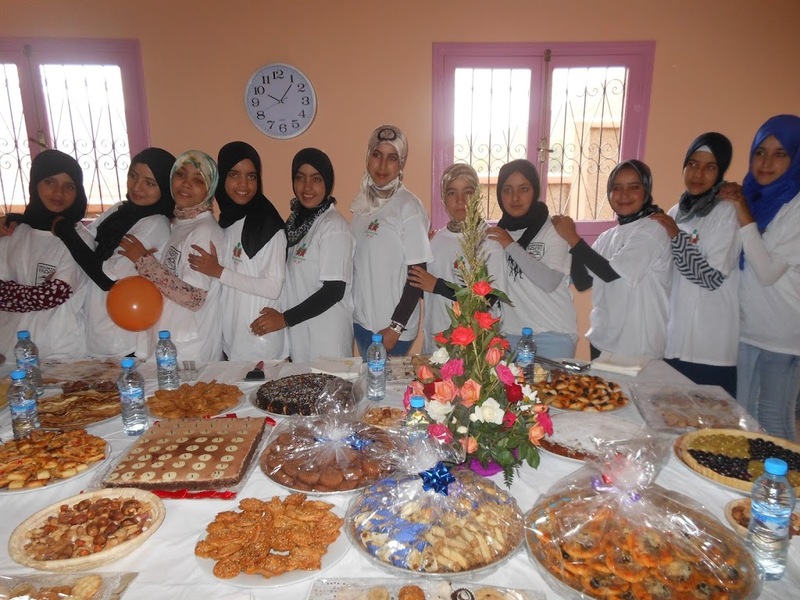 I was lucky enough to be placed in the new house in Asni with the older girls who attend the Lycee and I have now been volunteering there for almost a month. 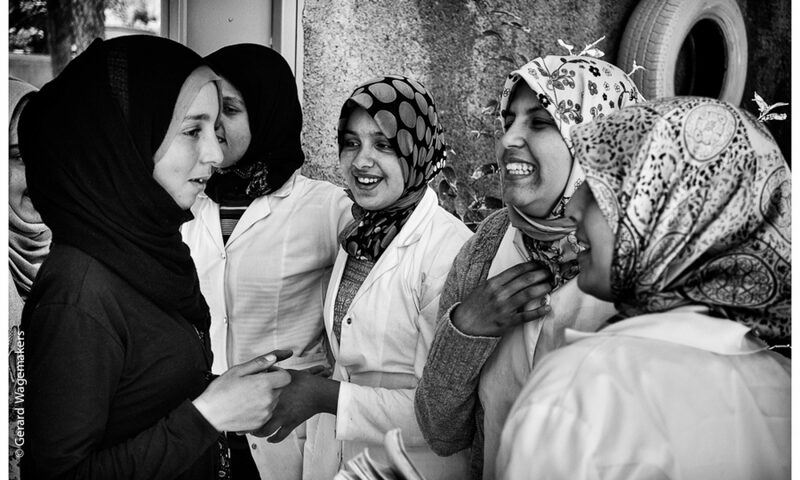 I was given a wonderful welcome by Khadija, the housemother, and the girls when I arrived. Since then I have been giving extra English classes when the girls have free time during the school day as well as helping them with homework in the evening. In addition I’ve been talking to them in French (which is as good practice for me as it is for them!) All in all I’ve had the most fantastic time as they are so keen to learn and we have been able to have fun even when going over English grammar! But the main reason that I am writing is to report on the official opening of the house on Sunday 1st November. Furniture had been arriving all week – both chairs and flatpack office stuff – the carpenter has virtually moved in; photos and information have been posted on the new notice boards; Khamissa, the cook has been baking solidly for at least four days and huge plates of cakes, biscuits and snacks (even chocolate ones!) 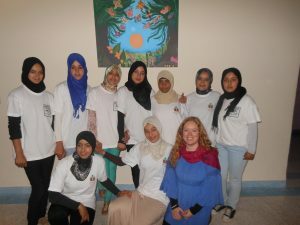 have been arriving from all the other EFA houses; Sinead, the volunteer from Dar Asni 1 has produced a lovely painting with the girls of butterflies taking flight; and on a more mundane level girls have been scrubbing the walls while Khadija has been briefing the older ones on their individual roles for the ceremony itself. The day dawned to the steady drumming of rain but the house was full of frenetic activity as all the tables which had been laid out on the terrace were brought downstairs to the dining room. And then the power went out, followed in quick succession by the water drying up as electricity is required to pump it up. This did not help the general stress levels of the staff but nothing daunted, buckets were filled with what little water was left in the hot tank and the table was laid up with huge plates of spectacular tarts, cakes, pastries and cookies as well as two stunning flower arrangements of roses. And this was a result of Maryk, one of the EFA Committee members, suggesting two weeks ago that there should just be a few simple refreshments! 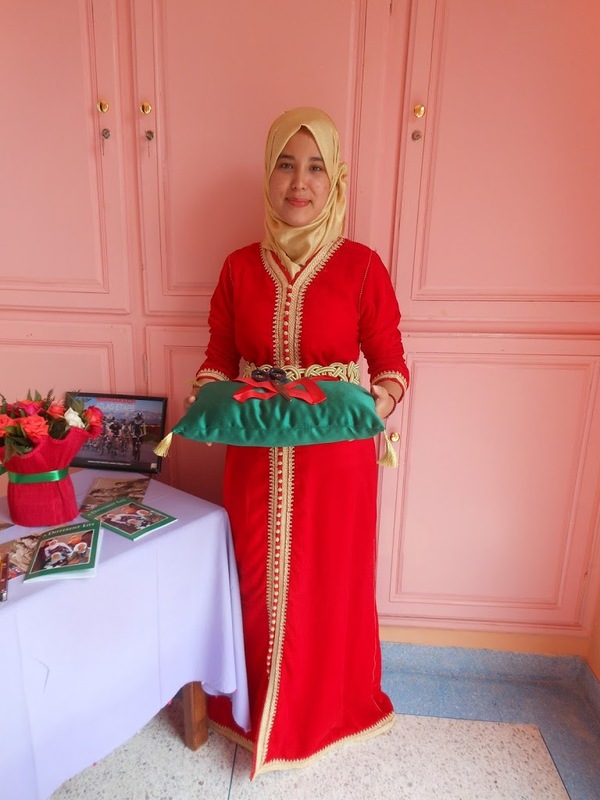 I have come to realise that in Morocco when guests are involved nothing is simple. The balloons that I had brought were put to good use, and I helped Zineb, one of the baccalaureate girls practise the short speech of welcome which she was to give. A few of the girls appeared in gorgeous brightly coloured and very elegant traditional dress. Although the whole thing was due to start at 11am most of the guests had arrived by 10.40 and it was so freezing and wet outside that the cutting of the ribbon and the official entry to the house went on ahead of time. The VIPS then were greeted with a little cup of milk and a date as they came through the entrance to meet all the girls who were lined up in the hall. Zineb delivered her speech impeccably and first all the guests were invited through for juice, coffee and (of course!) mint tea and politely grazed on the fantastic spread of food. Fifteen minutes later word was given that the girls could help themselves so in about 10 minutes the table was cleared of the best of the snacks particularly anything with chocolate as that is a major treat here! And after that the real party began as the drums were brought out and the dancing got under way. In the echoing hall the noise reverberated around the whole house and the girls, housemothers and staff had a ball! It certainly was huge fun as everyone dances together and there is loads of clapping and a certain amount of singing. After a prolonged photo session for the staff from each of the houses as well as several of the committee members and the VIPS most of the guests left and the girls kept on drumming! But I then had the chance to talk to one of the EFA girls who is now studying at Marrakech University. She was really impressive and told me in very fluent English how she was studying biology and hoped to return to the High Atlas to work on improving farming methods in the future. I asked her how she had found the transition from an EFA boarding house to the city, and she did say that it had been hard in her first year to cope with the demands of a pretty full day of classes as well as all the business of cooking and cleaning in her hostel. But she now seems well on track to complete her degree and I felt she was a fantastic role model for the other girls and really embodied the aims of EFA. And then the clear-up commenced – by now with electricity but still without running water. Ever resourceful, bottled water was used and the quantities of plates and cups were all washed and dried, though I think it felt terribly wasteful to use up all those precious supplies of bottled water on washing dishes, but there was just no alternative. And of course just as we finished a tiny stream of water appeared from the taps …! There was no doubt that it had been a hugely successful day, despite the challenges of no power or water, and I felt really privileged to be part of it. I have no doubt that when I return in the future there will be loads more improvements but for the time being it really is a fantastic house with 30 very happy and enthusiastic girls and some great staff. I already wish I could stay beyond the end of November! Previous PostPrevious Arrgh, it’s over already!